My name is J.D. Knight, and I am the creator and Webmaster of Sea and Sky. I currently live in Orlando, Florida where I work as a graphic artist, web designer, and Flash programmer at a local technology firm. A few years ago I decided to create my own Web site. When it came time to choose a theme for the site, I decided to base it on my two favorite hobbies. I have always had a fond interest in astronomy and space, so I decided to dedicate a large part of the site to the astronomy hobby. On this page I wanted to share some of my personal experiences with amateur astronomy. I call this page "My Sky". A few years ago a friend gave me a small refractor telescope. I used it to view the Moon and the planets and was always amazed at what I saw. Eventually, I fell victim to a astronomy disease known as aperture fever. I wanted a bigger telescope. 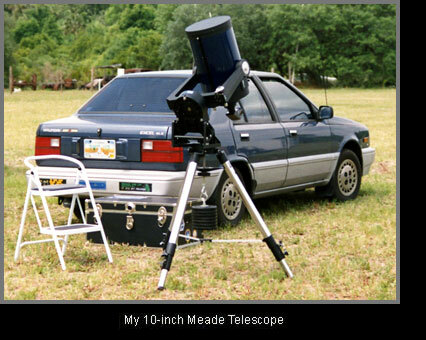 I managed to save enough money and purchased a 10-inch Meade Schmidt Cassegrain telescope with a motorized base. I was totally blown away by the improvement in picture quality with the new instrument. A short time later I joined the Central Florida Astronomical Society, our local Orlando astronomy club. CFAS is a wonderful organization, and during my time with the club I have made a lot of new friends. I eventually became interested in astrophotography. After investing in some good photography attachments for my telescope, I have managed to get quite a few good pictures. Astrophotography is particularly challenging here in central Florida because the weather is less than ideal most of the time. The humidity in the summer months renders the entire sky hazy on many evenings. My ultimate goal is to eventually acquire one of the new automated telescopes with a CCD digital camera in an outdoor observatory connected to my computer. Then I can be lazy and sit in the house and photograph the heavens until my heart's content. But for now, I am content with doing it the old fashioned way. Below is a small sampling of some of my astrophotos that I wish to share with you. 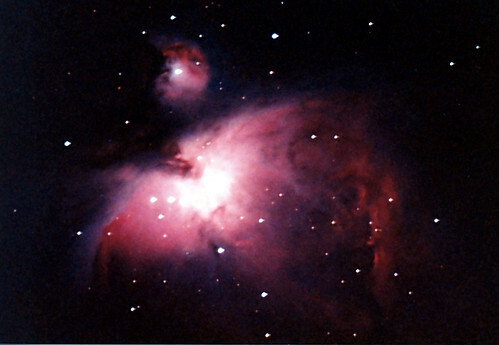 Photo of the Orion Nebula taken on 3200 speed film from the CFAS observing site. This image was taken with Kodak 3200 color print film which increased film. 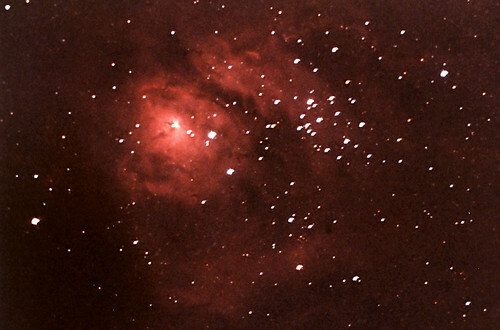 Photo of the Lagoon Nebula taken on 3200 speed film from the CFAS observing site. This image was taken with Kodak 3200 color print film. 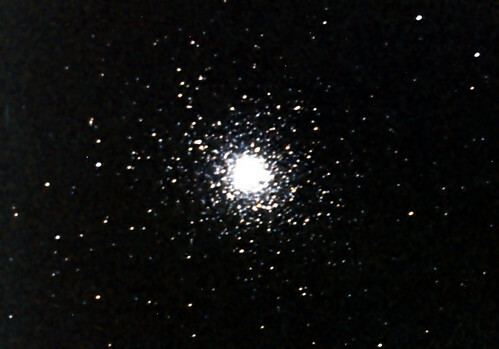 Photo of globular cluster M5 in Serpens taken on 3200 speed film from the CFAS observing site. This image was taken with Kodak 3200 color print film. and the famous red spot. 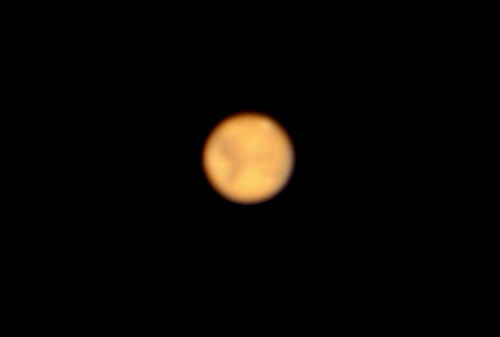 Mars was captured with my 10-inch Meade Schmidt Cassegrain telescope in Orlando, Florida on 10/1/88 while the planet was at its closest approach to Earth. This image was created on Kodak Ektachrome 100 color slide film. It shows some of the planet'sdark markings. The polar ice cap can be seen at the top. View of the full Moon as seen through my 10-inch Meade Schmidt Cassegrain telescope in Orlando, Florida on 10/25/89. This image was captured on Kodak Ektachrome 200 color slide film. 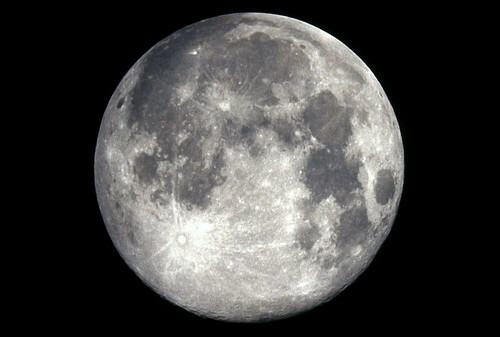 Surface features appear flat and washed out during the full Moon because their are no shadows. 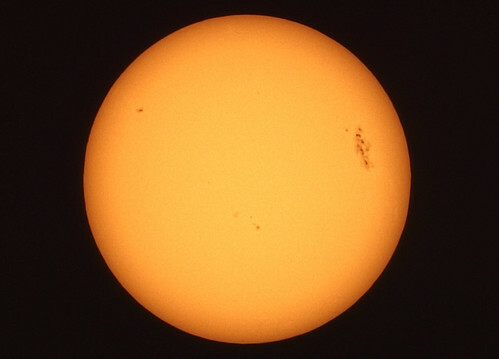 The Sun as seen through my 10-inch Meade Schmidt Cassegrain telescope in Orlando, Florida on 3/14/89. This image was captured on Kodak Ektachrome 100 color slide film with a Thousand Oaks full-aperture glass solar filter. The large group of sunspots on the right of the image were responsible for one of the only knoen occurances of the Aurora Borealis in Florida.